The ancient art of Body Sugaring Hair Removal is a safe, gentle, and effective solution to hair extraction. 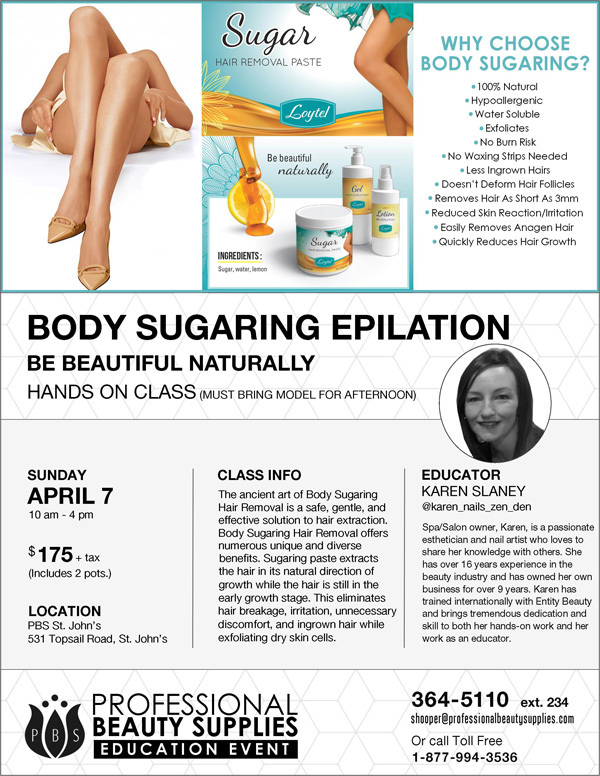 Body Sugaring Hair Removal offers numerous unique and diverse benefits. Sugaring paste extracts the hair in its natural direction of growth while the hair is still in the early growth stage. This eliminates hair breakage, irritation, unnecessary discomfort, and ingrown hair while exfoliating dry skin cells. The Ugly Duckling love is growing and we're excited to bring you more of their amazing products and tools. Fuel your passion as we dive into the world of Ugly Duckling Gel and E-File training. This course is open to experienced Nail Techs who want to learn the proper way to use an E-File and expand their knowledge into Ugly Duckling Hard Gel. Bring: LED Lamp, Files, Prep Products, and Tools. Note: Your will be working on yourself. Includes: Lunch, Ugly Duckling E-File, E-File Accessories, Gel, Brush and more. Give your clients the longer, fuller hair they've always wanted. Hair Affair Tape-In Extensions are quick, easy to install, and give you long, luxurious locks in an hour. Easy to put in, easy to take out, and easy to re-tape. Generate new revenue in your salon with extensions.